Looking out over the broad stretch of sandy beach on the Lake Superior shore near the town of Eagle River it’s hard to imagine that this shallow expanse of water was once a bustling shipping port. While it lacks a natural harbor such as those found at Copper Harbor and Eagle Harbor the mines near Eagle River built a series of docks and warehouses that turned the town into a hub of commercial activity. of the Keweenaw County Historical Society. The Keweenaw County Historical Society, The Keweenaw National Historical Park, and the community of Eagle River have worked together to develop The Eagle River Museum. The photo above, taken by John Deal, shows a group of Model A’s visiting the museum in 2016. The museum focuses on four major themes: The Cliff Mine; the town of Eagle River, the neighboring town and mine of Phoenix; and the amusement area known as Crestview which was located between Phoenix and Eagle River. The ceiling height of the first floor of the building was restored to its original height and new windows were installed before work was begun on designing and installing exhibits, etc. One of the first mines that used Eagle River as their port for shipping out copper and bringing in supplies was the neighboring Cliff Mine. 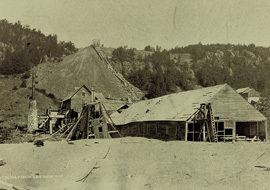 The Cliff was the first commercially successful mine in the Keweenaw. While the most productive time of the Cliff was 1844 to 1870 some work continued on and off through the 1930’s. During the 1844-1870 period the owners of the Cliff invested $110,000 in the mine and got back more than $2,000,000 in profits. The Cliff Mine and it’s relationship to and dependence on the town of Eagle River is one of the major exhibits of the museum. The Joseph Blight AKA The Original Lake Superior Fuse Company factory was located near the dam across the street from the museum. 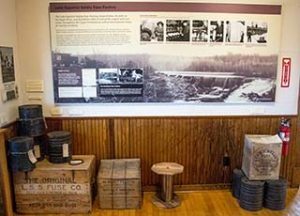 The museum also has exhibits on the important role the town of Eagle River played in the history of the Keweenaw and of the neighboring town and mine of Phoenix. As one example, the copper mines needed explosives and fuses to produce copper and one of the early factories for the production of mining fuse in the Keweenaw was the Lake Superior Fuse Company which built the dam that tourists see across the road from the museum. Another exhibit focuses on the Crestview Casino and resort area. The Keweenaw Central Railroad built a pavilion and recreation area between the towns of Phoenix and Eagle River in 1909 and called it Crestview. It was designed to encourage the use of the railroad beyond the mines. The Crestview Casino has a kitchen, running water, etc. and was used by individuals and groups seeking to enjoy a nice day in the country. Visitors could either walk to the shore of Lake Superior or take a wagon ride to the beach. It was estimated that over 500,000 people visited Crestview during its first year in 1909. Though Crestview was called a casino, gambling and alcoholic beverages were not allowed at Crestview according to the brochures published by the railroad. The 1914 memorial to Douglass Houghton is located on M26 just a short distance west of the museum. There are two memorials near the museum that honor the memory of Douglass Houghton. Houghton was Michigan’s first State Geologists and his 1841 report was responsible for the copper mining boom in the Keweenaw. A short drive from the museum in the Douglass Houghton Memorial. 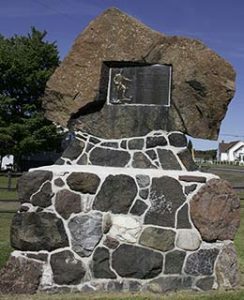 This memorial was dedicated on October 10, 1914 and contains ricks from many copper and iron mines in the Upper Peninsula. The memorial is now owned and maintained by the Keweenaw COunty Historical Society. In 2016 a State of Michigan Historical Marker was placed near the museum to also honor the memory of this important figure in the history of Keweenaw COunty. The Eagle River Museum opened on August 25, 2013. During summer-fall of 2017 it will be open on Wednesday, Friday, and Saturday from 12 P.M. until 4 P.M. and will close on October 8, 2017. Hours & Admission -The Eagle River Museum is open from 12-4, Wednesday, Friday, and Saturday through October 8, 2017. There is no admission fee for this museum but a donation is appreciated. Related Links – You may wish to explore the following sites for additional information about Eagle River and the neighboring Cliff Mine.